Circuit shown here can be used to jam FM radios in its vicinity. The circuit is nothing but a classic single transistor oscillator operating in the VHF region. Working principle of the circuit is very simple and straight forward. Powerful VHF oscillations from the circuit will interfere with the FM signals to nullify it. 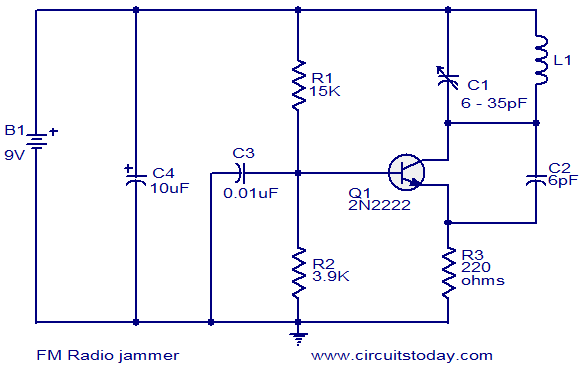 Jammer circuits like this are illegal in many countries and you must assemble this circuit on your own responsibility. This circuit is intended only for fun and i request you not to misuse it. For L1 make 6 turns of 16AWG enamelled copper wire on a 9mm plastic former. The circuit can be powered using a 9V PP3 battery. For extended range, use an antenna. A 30cm long wire connected anywhere on the coil will do for the antenna. For better performance, assemble the circuit on a good PCB. can u pls explian the the operation of the circuit like how the current flows from battery to till the end what is the function of all capacitors and resistors? What is the use of the C2 capacitor, the one with a 6pF capacity? 1.How long area does this radio jammer circuit can affect? 2.This circuit is connected into receiver or it work alone? I could find 14awg wire… so how many turns will it require? sir can you provide me a circuit for jamming mobile phone….. i.e the GSM frequency band..
Its not a radio receiver. Its a jammer. Like in movies. It doesn’t allow other receivers to work properly. thing one. where should I connect a probe to measure voltage by oscilloscope? It seems that a frequency depend on where i put the probe. the prove even detects the signal when it is detached from a circuit. thing two. even if there is no C and L in tank circuit except wires, the circuit makes oscillation like 200Mhz is it normal? Excellent idea… that those builders who insist on making me listen to their radio as well as their hammering sorted. I can take the hammering, just not the unnecessary noise! plZ tell me what is the value of L1??? Please see the notes for details. Hi Rex you can use shortest lead possible for all components in the oscillator stage. Try to wax them such that the winding and the frequency tuned circuit does not vibrate. Connect external antenna to the first turn from the supply end such that antenna should not load the tank circuit heavily. Use regulated supply with proper decoupling. I built it and it works like a charm! To increase power I have to change the 2N2222 with a 2N2219 and replace the power source with a 12V one? And regarding the power, in a few words, how can I calculate the emitted power? One last thing. What is the role of C2? Without C2 the circuit will not oscillate. You cannot calculate easily like total DC power supplied to the circuit divided by 2 or 3. as it requires many parameters to be calculated, you require like VSWR meter etc. I’d like to ask something about the capacitors. C4 is an electrolytic (polarized) capacitor and it must be installed the proper way, but what about C3 and C2? Can they be ceramic (without any concern for polarization)? Also, I couldn’t find a 6pF for C2. Is 6.8pF OK? Yes you are correct about C4 C3 and C2. You can use the nearest standard value 6.8PF in place of C2 instead of 6PF. Can the signal from the circuit be conected to a power amplifier, and in that case, how? Add a one turn coil as secondary to the tank circuit inductor L1 and connect it to an RF power amplifier with suitable tank circuit etc and with a capable power supply. i have difficulty in finding 6-35pF variable capacitor. my question is can i use two 3-15pF variable capacitor connected in parrallel? It is very interesting and I like this circuit as it is very simple. Can you provide this project kit? What is the cost? ok, I built this on breadboard and it works. I just used a coil a made about a month ago for another schema – 16AWG 100 turns on 20 mm diameter plastic tube. How you do the coil doesn’t seem to matter much because you set the frequency from the capacitor. Hi, if I calculate the values for L and C in order for this circuit to jam frequencies in SHF (GHz) will it do it or do I have to change some other component? Can the transistor sustain a frequency of say 3GHz? The circuit has to be totally redesigned the transistor the coil (L1 has to be a bar not a wound one) etc. what is the value of L1. I read thru the comments but didnt see anyone really reply to this question asked a couple of times before. how many milihenry? If you have the values of capacitor and inductor, you will be able to calculate the frequency generate by the oscillator with this operation: Fo = 1/(2*pi*sqrt(L*C)). Please mention the list of Components used? i want to made it as college project. how to make it jamm all the commercial FM frequency? please give the schematic to jamm all the frequency because this is my final project for my subject. ASAP please? can i use 2-22pF variable capacitor? are these capacitors are ceremic or else? I tried several ways to boost the signal, but without a doubt you are right this is the best one. Can you please tell me what frequency range does this circuit jam? and how can i change it to a certain frequency that i want to jam say 88.8 MHz? if could help me i would be very thankful . Why not place 2 varactor diodes face to face in parallel with the tank circuit and pump sawtooth waves (PWM) into that. Makes for a really nice jammer that covers a wide swath of area on the band. can i make a 6 turn coil from jumper wires or internet cable wires??? can we use this circuit as cell phone jammer? I want to make a small gsm signal jammer with a radius of 10mts. can u mail the schematic and parts list to my mail id? Hi Adi the component list you can make a list from the circuit and the notes. As for the function is concerned it is just an oscillator producing a blank carrier, which will beat with the transmitted signal and the demodulated signal at the receiver will not have any audible information except some beating signal. Can i have the list of the componentsand also the brief description? Hi Bo what for you require 3.5mm jack for jammer are you trying to modulate some signal is it. if it is correct. Hi, If i were to connect a 3.5 jack to the circuit, where would i do that. Between C3 and GND ? please need help! i couldnt find 16 awg wire.i m having 4 awg.can some tell to make inductor of 4 awg wire????????? ?As i hav selected it as my semster project i will have to make presentation in few days!!!!! I couldnt find 6pf capacitor.can i use 1pf and 5pf in parallel? ?plus i m having 4 awg wire will it work?? ?16 awg is difficult to be found. can i use 2n2222 plastic case or shd i use metal 2n2222 transister only? please confirm. also anyone tried this circuit and is it works fine?? This device can also jam tv. .
many oscilators but no 50Hz oscilators..? Hi friend the inductor is the part of the tuned circuit ( L1 and C1) resonates at the required frequency. The in ductor need not be very accurate. Does anyone know how many henries that inductor is? I tired using this: http://www.technick.net/public/code/cp_dpage.php?aiocp_dp=util_inductance_circle with the result being 270 nH. Does it really matter how accurate it is? I’m thinking it’s supposed to act as a small range antenna. Hi Raj assemble the above. tune FM radio to a station now switch on the above circuit adjust C1 till the FM station is blanked with the carrier beat. Hi Arun for increasing the power you read my comment dated 6th june. you cannot jam the entire FM band with a width of 20MHz by this simple device. hi if u found an answer for your question i would really like to know. Hi Jem it will be suitable for frequencies from 60 to 200MHz. heya, thanks alot for the link man, helped out alot, i apreciate the help you’ve given. would it be alright to use the ceramic variable caps they sell also, i’m planning on making a pcb and size matters lol, plus the capacitance more closely matches your design 🙂 also, could this schematic be used with some few tweaks to jam all sorts of frequencies, like cell or AM or anything else? Hi Jem it is common ground, that is earth plane of your antenna. If you donot want earth plane you can leave it and use only the wavelength / 4 whip antenna. I have not tried simulation but tried the circuit and it is working alright. ok thank you, now just one more question, i know what all the components are in this, but i’m having trouble translating in my brain how they all connect, i know it should be all easy because of the blueprint, but like, does the second path coming down south off the 9volt source, is that just another positive, or is that the ground coming back to the batter? and if so why the ground symbol on the bottom, is is a common ground for all the components? Hi Dishant it is in uH, not readily available and easy to wind air core 8 t0 10 mm id, 6 turns wound with 16 to 18 gauge wire with a gap between each winding of wire thickness. hi can u please give me value of L1 in henry?so that i can directly use inductor having that value? And if i want to block the whole fm band 88-108mhz.How will i to do? Hi Bryce yes. but if you want to only jam a particular broadcast tune only to that. T2+T3 do the job for increasing power. I don’t know L2 what is used for! How can i increase power? Adding another transistor as Rf amplifier? No former self supporting coil, 16 to 18AWG any one can be used. does the L1 have to be a 16 awg wire plastic former just give me a staight up answer. Hi Bryce it has to be in the range of 3 to 35PF. you can use FM tuner variable capacitor also. If you want to jam that station tune in and jam with jammer. Hi Bryce what capacitor value you have used for C2. It can be upto 10PF ceramic disc, L1 should be 6 to 9mm dia air core with 18SWG super enameled copper wire close wound 5 to 6 turns. set the trimmer C1 at the center. once the circuit is assembled keep it close to an FM radio tuned to around 100MHz. now switch on the jammer, with a plastic tool expand the coil axially till a blank carrier is heard in the radio. now your FM radio jammer is ready. Hi without emitter resistance the transistor will blow of. Resistance can be a near preferred value. THE JAMMER CAN WORK WITHIN A SMALL COMPOUND ONLY. Can Anyone tell me the value of INDUCTOR in henry?or any other compatible inductor.. The legality of the circuit depends on how and where you use it. It is basically a CW generator so a radio will just pick up silence. It differs little from the little transmitters that allow a CD player to be picked up on a nearby radio. There’s just no input where a mic or CD player could be attached. In most jurisdictions, the limiting factor is SWR. So if it can only be picked up for a few meters, the legality would depend on how you use it. If you’re only interfering with your own radio, it should be alright in most places. If you’re intentionally interfering with other peoples’ radios, then it’s illegal almost everywhere.